"All one has to do is hit the right notes at the right time and the instrument plays itself"
A Native of Columbia MD, David Gorrie's fascination with the guitar began at age eight. From that time forward he has explored just about every style of music including Blues, Rock, R&B, Country, Classical and Jazz. He earned his Bachelors and his Masters degrees in guitar performance from the Peabody Conservatory of Music (affiliated with Johns Hopkins University) in Baltimore, Maryland, where he was privileged to study with renowned RCA recording artist Manuel Barrueco. 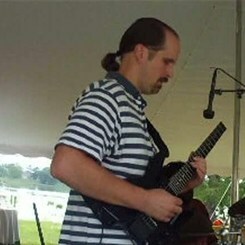 Since then he has pursued a career as a full-time guitar instructor teaching at Frostburg State University, Howard Community College, Potomac State Community College, Essex Community College and privately through Music & Arts Center for the past twenty-five years. David Gorrie's teaching method varies from student to student, with an emphasis placed on teaching to the student's specific goals for playing the guitar. Fundamentals are important but it is also important to have fun! David Gorrie also makes his living performing with the DC/Baltimore area's top bands, various jazz combos, guitar and violin ensembles and as a soloist.